Gita teaches clarinet in the Woodwind Department at the South Shore Conservatory. Gita is also the Yoga Chair of the Creative Arts Therapies Department at South Shore Conservatory, offering Yoga for Performers and Yoga for the Special Child® to individuals and groups on the South Shore of Massachusetts. Teaching is in my blood and I’ve loved engaging with students over the past 20 years! My father is a professor, and I knew at a young age that I was blessed to be born into a family that valued education, the arts, and intellectual pursuit. I started teaching music while in high school, and my goal for my students has always been the same: to serve as a guide to aid each student in realizing their own inner teacher. I provide: tools, techniques, awareness, technical knowledge, artistic context, and structure that facilitate a gradual process of artistic development, technical mastery, and ability to flourish independently. Clarinet instructor Gita Brown has been actively music teaching since high school. After completing high school at the Interlochen Arts Academy in Michigan, she received her Bachelor of Music in clarinet performance from the Eastman School of Music in Rochester, NY, and her Master of Music in clarinet performance from the University of Michigan. As she developed her performance and teaching career, she also became involved with the practice of music therapy, attending Alverno College in Milwaukee, Wisconsin, and has been a Board Certified Music Therapist for the past 7 years. Gita taught clarinet, music theory, music education, and adult continuing music education classes at the College of Lake County for 10 years, prior to beginning her position as clarinet instructor and music therapist at South Shore Conservatory in 2010. Gita is also Yoga Chair for SSC's Creative Arts Therapy Department. She is a Yoga Therapist, licensed in Yoga for the Special Child and a certified 500-hour instructor in Integral Yoga. Gita’s love of yoga developed concurrently with her music career. Initially drawn to the practice of yoga as a means to deepen her artistic connection, she began to notice the powerful effects of yoga on all areas of her life. Already in love with teaching music, adding yoga instruction was a natural progression, and she became certified in Yoga for the Special Child in 2006, and Integral Yoga in 2007. 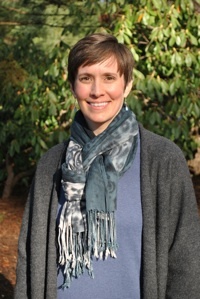 She continues to study yoga, taking several retreats per year, engages in daily yoga practice (meditation, postures, diet, study), and enjoys connecting with other yoga therapists at yearly continuing education classes. Gita Brown has been performing and engaged with her love of the clarinet since the 5th grade. After switching to the clarinet from the violin out of admiration for the clarinets rich and vocal-like timbre, she has enjoyed many years of deep study and social engagement through performance. She received her Bachelor of Music in clarinet performance from the Eastman School of Music in Rochester, NY, and her Master of Music in clarinet performance from the University of Michigan. Gita toured Japan and recorded an album as the bass clarinetist for the famed Eastman Wind Ensemble, and performed in many regional orchestras including Ann Arbor Symphony, Lansing Philharmonic, Adrian Symphony Orchestra, as well as chamber recitals throughout Southeastern Michigan. Gita also spent three summers at the Aspen Music Festival, performing on both clarinet and bass clarinet. Prior to moving to Massachusetts in 2009, she taught and performed at the College of Lake County in Illinois, performed chamber recitals in Milwaukee and Michigan, and performed at Alverno College in Milwaukee, during her time studying music therapy. Since joining the South Shore Conservatory faculty in 2010, Gita has enjoyed performing on faculty recitals and the famed Duxbury Music Festival.